Any couple of course want to spend time together in a ver suitable places. If the areas around them are can be said as “unproper”, they will choose to spend their good times where all their expectations will be fulfilled. In Indonesia, there are some places that always being hunted by the couple tourists, like things to do in Nusa Tenggara . The first location, and the nearest to the area of Gili Trawangan is this Mount Rinjnai. Of course you already familiar with this mount because this attractions is also included on some articles with Nusa Tenggara theme or topic. Maybe some still confuse about what’s the good thing of Mount Rinjani for couple. With only, Rp20.000,- two can hike the mountain with the guide, and then going to the top of the peak to see either sunrise or sunset. If that is not romantic, there’s nothing else. The next spot is also located inside the Mount Rinjani National Park, in fact, this Segara Anak is also part of the Mount Rinjani itself. Located down below the mountain, the view of Segara Anak is visible from far away. Included as one of the best things in Gili Trawangan that is also looks great as things to do in West Nusa Tenggara, Segara Anak lake now always used by the locals for fishing. For the tourists, they can rent a boat and circling around the lake to see how beautiful it is from upclose. Tips : Better visit these two attractions in one day. Gili Trawangan is indeed famous for its beaches, one of them is this beach that called as Sengigi Beach. Senggigi beach is like heavenly place for honeymoon, perfect for couple who love to do some watersports together. 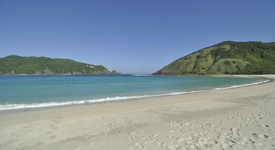 This beach is actually the most famous beach in all Lombok area. No wonder that there are many people visiting this location everyday. But don’t worry, even though it looks so exclusive, it’s pretty easy to reach it. One can rent a vehicle or hop in public transportation for about 10 minutes from Mataram city. Then they should pay Rp15.000,- for the administration ticket. Tips : Always prepare some money for public transportation. Next beach is this Tanjung Aan. Tanjung Aan is one of many Tanjungs in Lombok. It’s known for having such an unusual form of sand, that combined with the big and steepy stones. People who would love to swim here should be more careful becasue of those stones. Tips : Make sure that you come to the right date if you want to see the ceremonies. In the fifth location, we have this Sade Beach. Sade beach is a lonely beach that located in the area of Rembitan, Pujut, near Sade Village. Aside from the beauty of the village with its unusual culture that tourists interested, they can also enjoy the quietness of Sade Beach. Yes, even though there are not a single supporting facility like resting area or anything, Sade beach can give us the feeling of a true natural attraction. The environment, and the location is still in their own condition without interrupted or destroyed by humans. The next area is the area for the surfers who seeking the best location with the best wave in Gili Trawangan area. The place is calld Bangko-bangko, heaven for surfers as they said. It’s one of the 10 beaches with challenging waves, based on International Surfing Association. 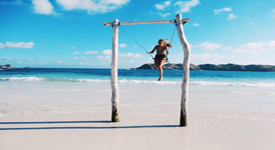 Having wonderful location just like things to do in Kupang, Bangko-bangko is also being developed because the place is becoming the number one tourist attraction Gili trawangan. No wonder that you can find so many hotels there, to support the overwhelming tourists. It’s only Rp10.000,- to enter. 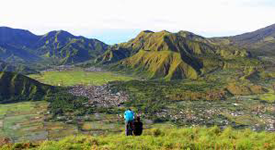 Then in the seventh place, we have this place called Sembalun. Sembalun is actually located just near the Mount Rinjani, that’s why you can see all the view of Lombok if you want from here. But, the selling point of this place is the view of the rice field squares. They just like green carpet reaching horizon, and it’s so wonderful to see. Bring a camera here and just take everything in this place. From the view of the sunrise that reflected by the surface of the rice fields, or the view of foggy Mount Rinjani. All you can get with only Rp5.000,- worth of entrance ticket. Beside the seven locations we provided above, there are some other places waiting for you, that can be used for another alternative beside those seven spots. So here it is, other places inside the romantic things to do in Gili Trawangan. Those are the wonderful places that should be included in the list of romantic things to do in Gili Trawangan. It’s such a beautiful place to visit, either for the family holiday, or private holiday that is fitting for two. This can be a great alternative beside the known island, Bali. Usually, during the holiday Bali island will be filled with people around the world. And for the couples out there who want to seek calmer and quieter place, then Gili Trawangan would be a great choice for them.